Welcome to De Smet, Laura's Ingalls Wilder's Little Town on the Prairie! We are honored to have you visit our great community. First and foremost, we want to help you make the most of your time and answer any questions you may have about what there is to do and see in De Smet and the surrounding area. We offer a bus tour that presents the history of the Laura, De Smet, and the surrounding area. Our gift shop that features unique art and gifts made by local artisans and Laura-lovers. Even if you have all the information you need, aren't interested in the bus tour, and don't need to buy another souvenir, our restrooms and Wi-Fi are always available if you need them! The bus out at the Silver Lake lookout. In September, we offer the bus tour daily at 1 pm. We will not have a bus tour on September 21, 28, 29, and 30. We offer a private tours by appointment. These tours can be customized but generally take about 3 hours. The cost is $50/person or $300 for groups of 7 or more. In 2015, we purchased and renovated the Buchle Drug Store. It's still a work in progress! We have have worked with local artists and past visitors who have created unique pieces of art and gifts. We also have a large selection of books about Laura and South Dakota. Here are two of our favorite current pieces. Both are one-of-a-kind. The piece on the left (or top) was created by Jodene Shaw of White Owl, South Dakota. Jodene created a series of pieces that are inspired from the different songs in the Little House books. They are wonderful! The piece on the right (or bottom) is a vintage spool carved and painted with the homestead claim shanty. It was created by Marcie from Kansas who has visited De Smet multiple times. She created a few different pieces featuring the Surveyor's House in De Smet and the log house in Kansas. These are a true keepsake! What is the hours of the Ingalls Homestead and where is it? Memorial Day- Labor Day 9:00 A.M. until 7:00 P.M. It is located at 20812 Homestead Rd, De Smet, SD 57231. It is 1/2 mile east and 1/2 mile south of De Smet on the family's homestead land. What are the hours of the Laura Ingalls Wilder Memorial Society and where is it? 9:00 A.M. until 5:30 P.M., tours go out every hour on the half hour, with the last one at 4:30pm (or 5:00 on busy days). It is located at 105 Olivet Ave, De Smet, SD 57231. It is in the northeast corner of De Smet 1 block from the Kingsbury County Courthouse. What pageant is it this year, when is it, and where is it? July 7, 8, 9, 14, 15, 16, 21, 22, and 23. The gates open at 6pm and the show begins at 8pm. The pageant grounds are at 43387 Rose Lane, De Smet, SD 57231. It is just north of the Ingalls Homestead east of De Smet. Advance tickets are not necessary. The pageant has never turned anyone away. Where is there to stay in De Smet? The De Smet Super Inn Deluxe, Prairie House Manor Bed and Breakfast, The Heritage House, or the Cottage Inn Motel or camping at the Ingalls Homestead. 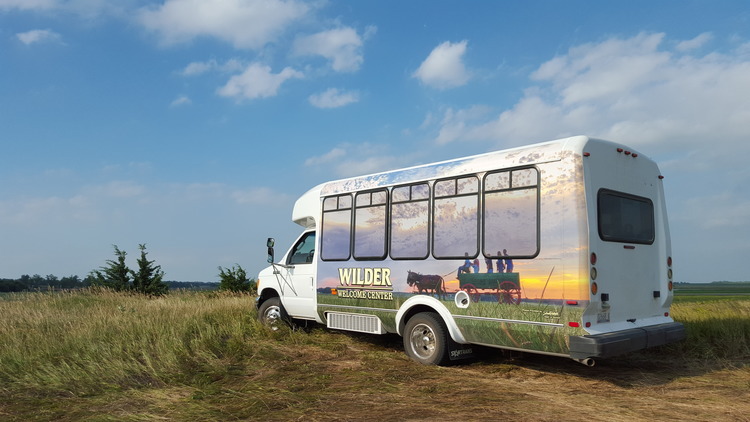 We started the Wilder Welcome Center and the Prairie Bus Tours in 2015. Our family also runs the Ingalls Homestead and this is our new venture. 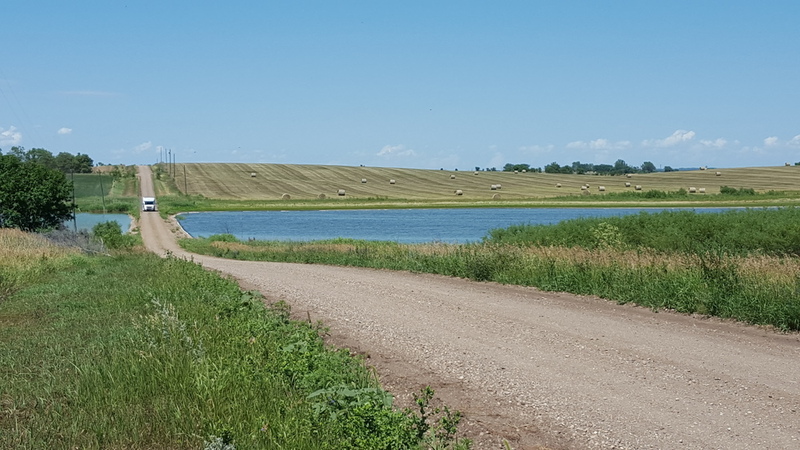 After years of answering questions about how to get to various places and seeing the desire visitors have to get out and see the prairie landscape, we decide to offer a bus tour. We were able to purchase the old Buchle Drug store in the spring of 2015 and began renovating it. It is a work in progress. :) We would love your input on how to improve our project. Some of the best ideas have come from visitor suggestions. Feel free to contact us however is most convenient for you. As you may have read above, we also run the Ingalls Homestead. You are welcome to contact us there as well with any questions. Email is great! We hope to have a Facebook page up and running soon as well. or through the form below.